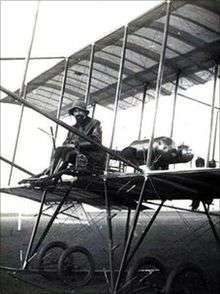 Giulio Gavotti on a Farman biplane, Rome 1910. Giulio Gavotti (17 October 1882 in Genoa – 6 October 1939) was an Italian lieutenant and pilot, who fought in the Italo-Turkish War. He set two firsts in the history of aerial warfare of heavier-than-air flyers: he was the first man to make an aerial bombardment, as well as the first to perform a night mission. On 1 November 1911, he flew his early model Etrich Taube monoplane against Ottoman military in Libya. He took four grenades ("Cipelli") to a leather pouch, each of a size of grapefruit and weighing approximately four pounds. Flying at an altitude of 600 feet, Gavotti screwed in the detonators and tossed each missile over the side - three onto the Tagiura (Jagiura) oasis, and one more onto military camp at Ain Zara. Gavotti’s scheme injured no one. The oldest known preserved Etrich Taube, in Vienna, Austria, is possibly a near-twin to the aircraft Gavotti flew in 1911, as both are said to have been powered with inline-four cylinder liquid-cooled powerplants. After this and further missions, the Ottoman Empire issued a protest. The dropping of bombs from balloons had been outlawed by the Hague Convention of 1899, but Italy argued that this ban did not extend to heavier-than-air craft. Gavotti performed the historically first night mission of a heavier-than-air aircraft. It took place as part of the same campaign in Libya on 4 March 1912. 1 2 3 4 5 6 Grant, R.G. (2004). Flight - 100 Years of Aviation. Dorling-Kindersley Limited. p. 59. ISBN 1-4053-0575-4. 1 2 3 4 5 6 Chant, Christopher (2002). Austro-Hungarian aces of World War 1. Oxford: Osprey. pp. 38–39. ISBN 1-84176-376-4. ↑ "Libya 1911: How an Italian pilot began the air war era". BBC News Website. May 10, 2011. Retrieved May 10, 2011.